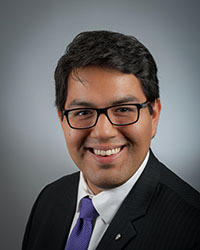 Christopher Rios serves as the Chairman of the Board for CommUnityCare. He is a proud graduate of the Red McCombs School of Business at the University of Texas at Austin. Mr. Rios is an experienced banking and risk management professional. He is currently an Assistant Vice President at Texas Capital Bank, where he specializes in credit risk analysis and portfolio management for the Austin, TX commercial market. Mr. Rios is also a graduate of Hispanic Austin Leadership (HAL), a leadership development program of the Greater Austin Hispanic Chamber of Commerce. He now serves as the Director of the HAL Alumni association. Mr. Rios is also a proud member of the National Association of Public Health Centers (NACHC), an INDIEpendent ambassador of the Austin Film Society, and a graduate of the A.I. S. D. UpClose education advocacy program. Mr. Rios is a strong advocate for local economic and business development, leadership development, public health services, education, and the arts. In his spare time, he enjoys attending various sporting events and film / music festivals that our amazing Austin community offers.